Margaret Stevenson, a Queensland-based commercial fishing industry leader, has been working in the sector for 30 years. Eric Perez talked to Margaret about her leadership journey. Eric Perez: The commercial fishing industry has been part of the Australian story for generations and was built on the ingenuity and hard work of commercial fishing families. Australia’s fisheries are built on the work of family run, micro and small businesses. This article is part of a series of interviews with leaders in seafood. I have had the great fortune to work and learn from outstanding women leaders in the Queensland and broader Australian seafood industry. This article explores the leadership path of one such leader, Margaret Stevenson. In addition to her work in a commercial fishing business, Margaret is the Queensland Director of the Women’s Industry Network Seafood Community (WINSC) and a deputy coordinator of the Queensland Seafood Industry Association (QSIA) net fishery committee. What prompted you to take on leadership roles? Margaret Stevenson: From the time we married, my husband Graham and I have worked as a partnership in our own business. As various fisheries management changes rolled around, it seemed unprofitable for him to take time off work to do submissions especially when he attended meetings on behalf of other fishermen and was on the subTrop MAC. Since his work was the income generator it made sense for me to work on submissions and allow him to continue to create the income we needed to provide for our large family. I had close associations in primary industries in my upbringing and understood basic economics. I had accounting training and had been an early childhood and primary school teacher. I began to understand more and more about fishing and fishing issues and realised that, like myself, the general public needed to know much more about fishing. I started attending QSIA meetings and met more industry people. 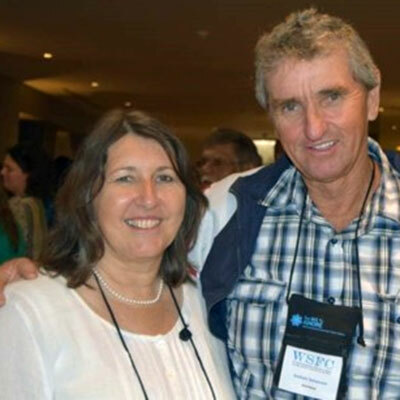 Then, I joined WINSC upon its establishment and, due to an initial lack of numbers, took on various executive roles in our local Queensland Branch. During meetings with WINSC and QSIA, I found I often had thoughts that no-one else seemed to verbalise so I started contributing more. I found people seemed to like the outside-the-box way that I thought about issues and that I expressed concepts that some others had not previously considered but liked. WINSC gave me opportunities to attend and speak in various forums. I visited schools, attended Great Barrier Reef Marine Park Authority Stakeholder consultation groups, and had the privilege of attending and speaking at the 2nd World Small Scale Fisheries Congress in Mérida, Mexico in 2014. In each situation, I found people would say to me that they had never previously thought about some concepts and aspects of commercial fishing in the way I explained issues. My comments changed their perceptions and sometimes moderated proposed actions. My confidence grew as I discussed issues further and researched to understand more. It seemed evident that I had knowledge and perspectives worth contributing and, hopefully, added a sense of balance to consultation processes. While Graham taught me about commercial fishing, he found it difficult to express his thoughts on various issues in public settings even though he had taken on leadership roles. Graham felt it was important that someone do so and it concerned him that too few were willing to step up. EP: What encourages you when you face challenges as a leader? MS: I think of other leaders who have done hard things and keep the overall objective in mind - saving the public’s right to have access to their own seafood and saving the jobs of those who catch the seafood. I would find it difficult to live with myself if fisheries were wiped out and I had not done everything within my power to make a difference. I do not want to let down my husband, my children, other extended non-angling family members, and other fishermen and their families for whom I have great respect. These people deserve the best effort to help them in their plight with the state of flux the industry has been in for nearly twenty years. If I can express concepts in a way that might have a positive influence then I ought to do so. I also think of the younger generation who deserve a chance to be involved in commercial fishing, if they are so inclined, and I want to help ensure that they get to do so. So many times you hear people encouraging their kids saying they can do anything they want to as a career but these days there is an implied, “except commercial fishing”. There ought not to be! I also think of those who have faced long-term persecution in the past - and appreciate their hardships. That helps me to keep things in perspective to some degree. EP: What challenges have you faced in becoming a leader? MS: It takes a huge amount of effort and time that I would rather spend doing something else. It is certainly difficult when facing very limited overall success. Sometimes it is difficult to work with fishermen who seem to prioritise their own personal benefit over the needs of industry and the community at large. EP: Do you have a leader as a mentor? MS: My father is still a police volunteer at the age of 82. He had also been involved to a certain extent in politics and was a member of the local council. He advised me before I met the fisheries minister for the first time. His advice helped me to be confident and not be intimidated by the minister’s position of power while striving to also show respect for the minister’s role. I think that also helped Graham to feel a little more comfortable in the situation than he might otherwise have been. I have also admired others within the industry and WINSC who have demonstrated great examples of service and leadership skills. Elaine Lewthwaite, Leonie Noble, Anne Whalley, Martin Bowerman, John Olsen, Michael Gardner, Kevin Reibel, Mary Howard, Donna Cook and many others have all been mentors in their own ways although they probably were unaware of their influences on me. I learned from them by being involved and witnessing first hand their commitments, efforts and sacrifices on behalf of industry. EP: Tell me about your journey to being the Queensland Director of WINSC? MS: I follow in the footsteps of Anne Whalley who was Queensland Director for many years. Anne was passionate about industry and about WINSC. She valued opportunities for women to have a voice in political circles, network, up-skill, and showcase themselves in the industry. Anne’s family was already grown whereas mine were still very young when I first became acquainted with Anne and watched her tireless efforts to attend meetings and participate in forums, conferences and activities. She was always very supportive of any effort I made to be involved in spite of the constraints with my children. I felt for Anne as she was Queensland director for year after year and no-one seemed anxious to relieve her of the duty. In the end, she and her husband retired and I was one of a small band of Queensland members of WINSC left to carry the torch. Anne encouraged me to nominate as Queensland Director saying she felt I had a lot to contribute so I agreed and was voted in. Margaret’s leadership journey continues next time. If you would like to contact Eric or Margaret please send an email to AustAgLeaders@gmail.com.